Tag line: "A Lethal Terror Snowballs Into Hell!" Produced for around $250k, The Crazies is yet another low-budget feather in the cap of director George A. Romero. Focusing squarely on how those in authority deal with a crisis, The Crazies is an action-packed thriller, an edge-of-your-seat nail-biter, and an eye-opening experience. A plane carrying a biological weapon crashes near the small town of Evans City, Pennsylvania, releasing a deadly agent (known as the “Trixie” virus) into the local water supply. Hoping to prevent the spread of a highly infectious disease, the military, under the command of Major Ryder (Harry Spillman), is sent in to quarantine the area. Troops slowly make their way through town, rounding up citizens and shuffling them off to the local high school for safe keeping. But with no idea what's going on, many residents aren't exactly willing to cooperate, including Judy (Lane Carroll) a nurse, and her fiancé David (Will MacMillan), a fireman. Judy's pregnant, and David has no intention of allowing the army to control their destiny. Determined to make it to the safety of the next town over, David, Judy, and a handful of others head for the hills. But with the military under strict orders to shoot whoever is not cooperating, how good are their chances at making it? The Trixie is a nasty virus, and we're shown first-hand just how terrible it can be (in the opening scene, an infected father of two murders his wife and sets his house on fire, his two young children still inside). 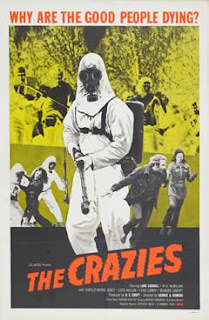 But like many of Romero's best films, The Crazies is about more than a biological agent; it also takes aim at military intelligence. When troops are given orders to round up the citizens of Evans City, and to use whatever means necessary to do so, it leads to a number of chaotic shootouts, resulting in the deaths of townsfolk and soldiers alike. The personnel in the field are as much in the dark as the good people of Evans City, and have no clue why they're being asked to lay their lives on the line. Initially, the operation is led by Maj. Ryder, who's been in town since the crash was first reported. Once the order comes through to seal off the entire community, Ryder has neither the resources nor the manpower to pull it off. What's more, he doesn't have all the information. Initially told Trixie was a benign antibiotic, Ryder gets the real story from his replacement, Col. Peckem (Lloyd Hollar); that they're dealing with a virus designed for biological warfare. What neither Ryder nor Peckam know is the big boys in Washington, fearing the quarantine won't contain the virus, have ordered a bomber, packed with a nuclear warhead, into the air. If things get out of control, all of Evans City and everyone in it, including 1,500 military personnel, are to be obliterated. Along with its very tense story of a viral outbreak, The Crazies dares to challenge our faith in authority. Do the people whom we put our faith in have any idea what they're doing? As Romero shows us time and again throughout The Crazies, our willingness to question authority may mean the difference between life and death. "Along with its very tense story of a viral outbreak, The Crazies dares to challenge our faith in authority. Do the people whom we put our faith in have any idea what they're doing?" Indeed!...a question we should probably ask ourselves more often. Those two sentences make me especially want to see this flic. Thanks for pointing it out.